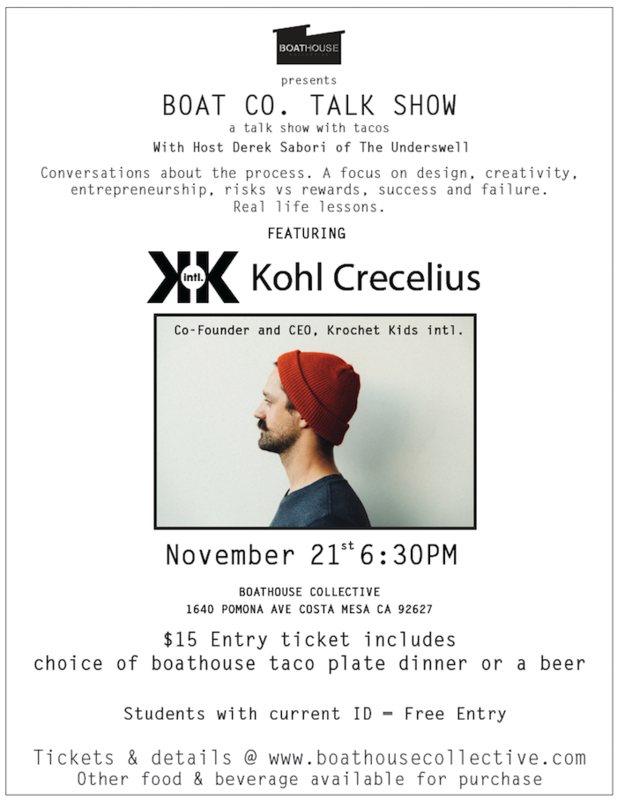 Boat Co Talk Show Continues with Kohl Crecelius of Krochet Kids intl. The Boathouse Collective, a creative space dedicated to the arts, community, culture and music and to culinary excellence and the craft of the cocktail, continues the Boat Co Talk Show (BCTS) series with guest and social impact entrepreneur, Kohl Crecelius. The BCTS is a monthly exploration of the diverse, creative and entrepreneurial talent that resides right here in our backyard. The show’s goal is to contribute to a better world, starting with our own community, by inspiring future leaders with stories of positivity, perseverance, and hard work. It’s an hour that will entertain, uplift, challenge convention, provoke thought, and stir emotions. With a focus on the personal journey, host Derek Sabori of The Underswell takes a living-room-chat approach to get the stories that matter, and to draw out the insights that can help professionals and students of all ages as they craft their own career, and personal life, trajectories. On Monday, November 21st Derek will sit with Kohl, Co-Founder and CEO of Krochet Kids intl., in a candid and personal deep dive discussion. These talks take the audience down the personal paths of brand building, entrepreneurship, and the journey of careers. Expect conversations about the process, risks vs rewards, success and failure; real life lessons. The Boat Co Talk Show offers a relaxed venue, with drinks, beverages and Q&A opportunities alike. Doors open at 5pm, Taco Dinner plates available 5-6:30pm. Talk begins at 7pm, sharp. Tickets and more details are available at www.boathousecollective.com. The event is free to students with a current and valid ID.